Ready made Cross Stitch designs, embroideries and easy to make kits, now available at Oriental Stitch. 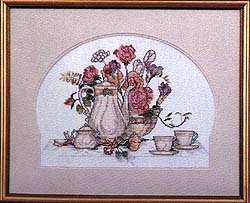 Decorate your homes and offices with designs from Oriental Cross Stitch and Embroideries. Whether you like to stitch as a hobby, would like to give it as a gift, or you are an admirer of handwork, you have come to the right place. We offer Kits, finished designs, charts, embroideries and needlework at the best price with money back guarantee. For those who appreciate needlework but do not find time to stitch, we have ready made cross stitch and embroidery designs. Hours of dedicated stitch work, to beautify your surroundings. View our catalog to find some great designs. If you have a picture, photograph or a design that you would like us to convert to a cross stitch design, or would like us to stitch, contact us for details. Note:- Finished designs are subject to stock. If stock not available allow 8-10 days for shipment. Customers are advised to verify stock before ordering. Web site Designed and maintained by Oriental Web Services.